The recent brutal murder of Bobby Stott has produced a reaction of horror and revulsion throughout the Derry Community amongst both Catholics and Protestants. We, the undersigned, feel particularly sad and disillusioned since Bobby was a member of our group (a mixed one of Protestants and Catholics) which visited Holland during the summer to study community work in that country. Although the group spent only a week in Holland, during that brief period we all came to know and respect each other, despite religious and political differences. Bobby, like all of us in the group, came away with a deeper understanding of, and respect for, those who differed from him in religious and political outlook. We in turn learnt to respect and understand Bobby. The study trip was a practical reaffirmation of the belief that Catholics and Protestants are capable of reaching out and understanding each other if given the opportunity to get behind the religious and political stereotypes we all hold of each other. Do those responsible for Bobby Stott’s death, whoever they are, really believe that the killing of fellow-countrymen and members of this community will help in any way to resolve our present problems? 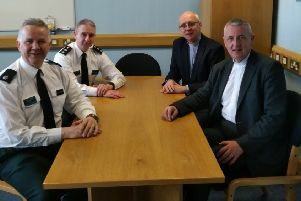 Such actions will serve only to heighten community tension and push us further along the road to open sectarian conflict and eventual civil war.Dialogue, open and honest, is, as the trip to Holland and many other community activities have confirmed, the only real and lasting solution to our present difficulties. It is particularly tragic, therefore, that someone like Bobby Stott, who showed his willingness to hold out the hand of friendship, to listen and learn, should be struck down in such a brutal manner. If his death serves any purpose, it will, we hope and pray, unite us all in a common rejection of violence in our midst, whoever perpetrates it. Tom & Jean Lovett, Garden City; Colm Cavanagh, 51, Troy Park; Eamon Deane, 63, Marlborough St; Julian Daly, 51, Elmwood Tce. Bridget Bond, 132, Iniscarn Rd; Eamon Melaugh, 45, Cromore Gdns; Danny Cooley, 5, The Crescent, Shantallow; Elizene Curran, 185, Lone Moor Rd; Marlene Jefferson, 22, Richill Pk; Joy Turner, 3, Henry St; Alex Hamilton, 98, Heron Way; James Mitchell, 154, The Fountain; John Taylor, 32, Lapwing Way.